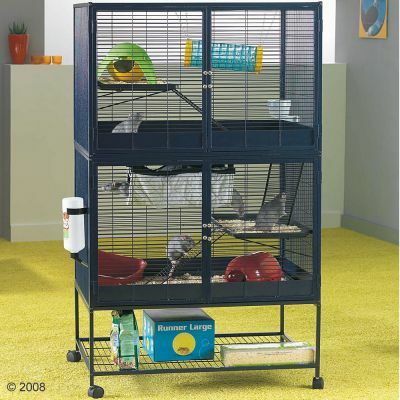 This luxurious cage provides your pet with a perfect home! This cage was designed according to the wishes of owner and pet. The complete front can be opened to allow easy replenishment of food and cleaning of your pet´s cage. The additional level gives a lot of extra space and freedom to move about. The entrance to the top level can also be locked in the case of your pets needing to be kept separate when ill. The supporting legs of the cage have 4 rollers attached making it simple to move the cage about. It gives you the space to carry out essential daily maintenance like feeding changing the hay etc. The wire mesh is in a dark navy-blue that doesn´t just look great it also is incredibly durable and robust. The Royal Suite comes with 2 additional levels and ladders. Size Total 95 x 63 x 159 cm Cage 95 x 63 x 120 cm Width of mesh holes 16 mm (not recommended for small rats) This product cannot be delivered to Northern Ireland.